From the moment we arrived by train, I knew there would be many things to do in Copenhagen with kids. Denmark is a peninsula that juts out into the sea route from the North Sea to the Baltic Sea. Norway and Sweden are to the north. Germany forms the land barrier to the south. Copenhagen is located on the island of Zealand, which is closer to Malmo, Sweden than to most of Denmark. What is there to do in Copenhagen with its seafaring history and harbor-heavy attractions? For families, investing in the Copenhagen Card is a good place to start. It made a lot of sense for our family because it includes public transportation on buses, trains, or ferries. Purchasing single trip tickets can be a real hassle! The Copenhagen Card made it affordable to see more attractions than if we paid for each transportation option separately. Almost all the attractions I mention, plus many others, are part of the Copenhagen Card deal. My teen son who loves museums says the National Museum of Denmark may be the most impressive museum he’s ever experienced (and he’s been to A LOT of museums). He and my husband spent hours there. It’s free with your Copenhagen Card. It looks dreary on the outside but it covers thousands of years of Danish history. The artifacts ranged from ornate Viking swords wielded by royalty to everyday cookware used by the Danes in the Stone Age. It was the most comprehensive of the human experience they’ve ever experienced in one museum. “Havn” in Danish translates to “harbor” in English. You’ll see this word put together with other Danish words often to describe the geography of the city. 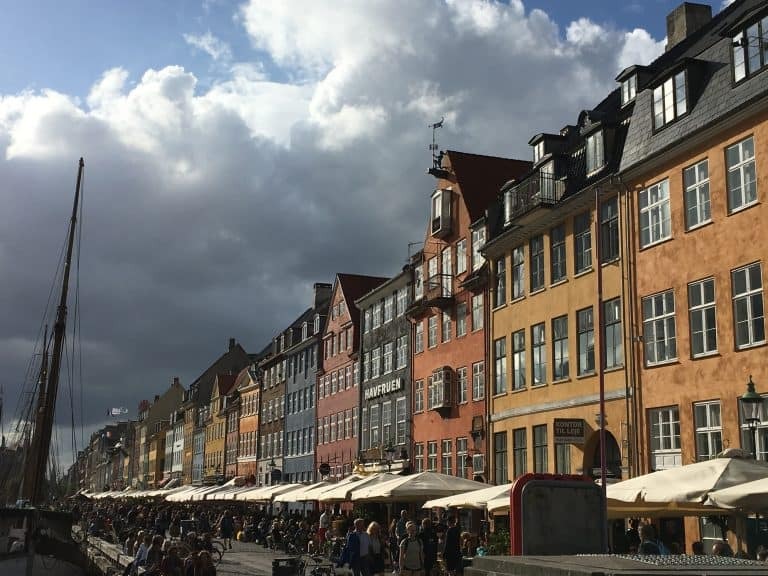 In fact, Copenhagen is the English language version of Kobenhavn and “Nyhavn” means “New Harbor.” It’s the most iconic photo spot in the city, but that also means it’s a tourist center. I’m including it on the list because it’s a must-see. We walked through Nyhavn nearly every day on our way to public transit stations. It was lovely to see the light change on the buildings and see the colorful reflections in the canal. This is also where we enjoyed our waffeln (waffles) at the Vaffelbageren with lots of people-watching to accompany the sweet treat. Watch the little ones because the edges near the water are not protected and you wouldn’t want anyone ending up in the harbor. Parents will like the pedestrian-only street lined with bakeries and coffee shops (ooh! SUCH good coffee in Copenhagen). Stop in the LEGO flagship store and let the kids get inspired by the models and displays in the store. The kids can also build and create in the Living Room, the center of the store. 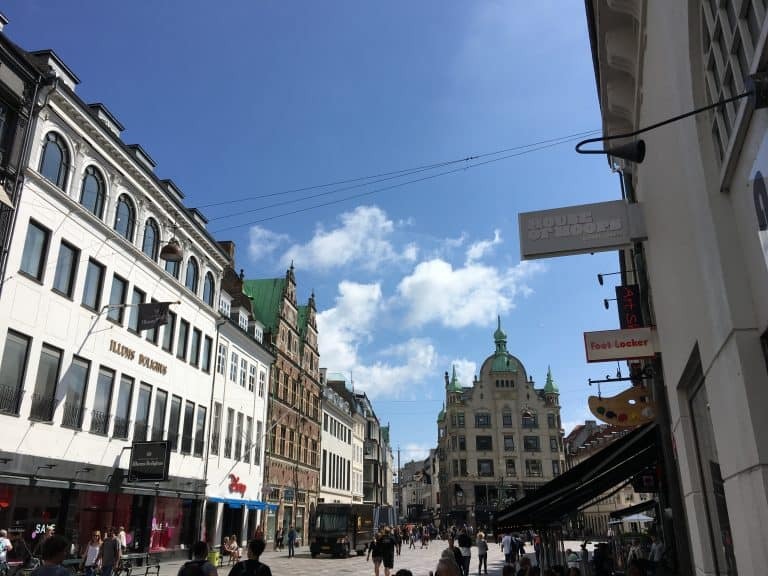 Magasin du Nord at Kongens Nytorv is an incredible multi-floored department store with everything including groceries, gifts, and a restaurant with city views. We experienced several modes of transportation in Copenhagen and were impressed with them all. My parents wanted a ride over to Tivoli Gardens. It ended up being the perfect distance for them to grab a Pedicab. 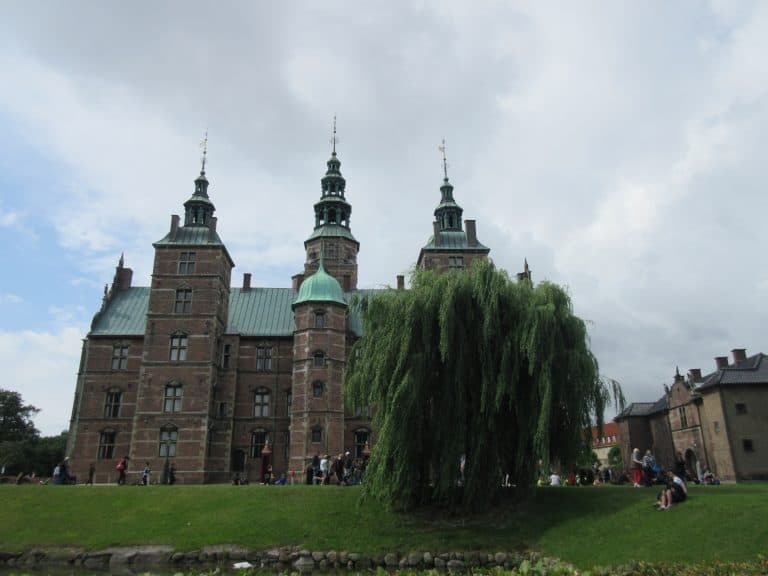 We took the bus to Rosenborg Castle and the Metro to the big national aquarium and the airport. The public transportation is extremely clean and an easy way to get around the city. Denmark is a constitutional monarchy with present-day Her Majesty Queen Margrethe II in rule. 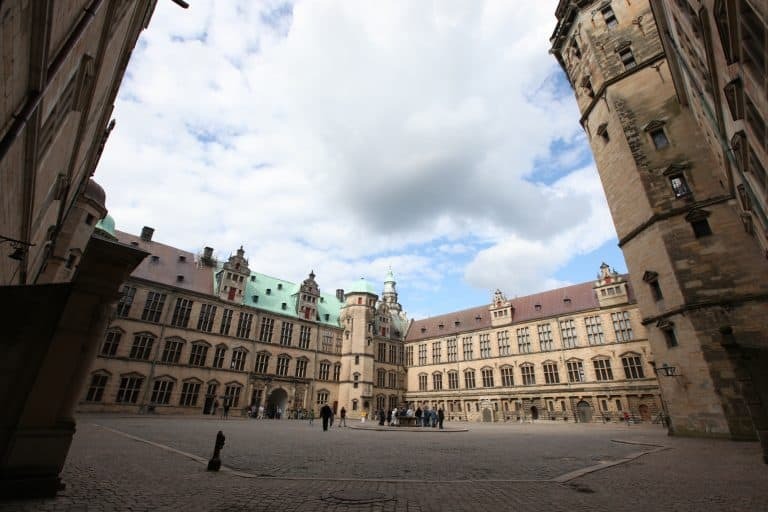 Rosenborg Palace is open for visitors with extensive Kings Garden and a chance to view the crown jewels. Every day, the Danish Royal Guard marches from Rosenborg Castle to Amalienborg Palace for a Changing of the Guard Ceremony. Even watching the guards prepare for their march at Rosenborg was entertaining for my children. 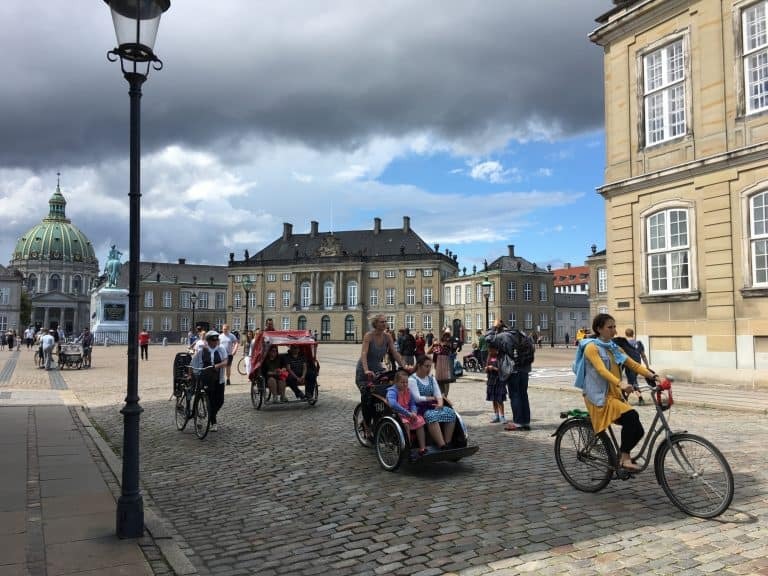 Amalienborg Palace is where the Queen keeps her permanent residence and you can experience some of royal life at the Amalienborg Museum. Even if you don’t visit the museum, walking the palace square with its statue of Frederick V is a worthwhile endeavor especially with its proximity and views of the harbor. The Rundetaarn involves a walk up a wide spiral ramp that was built to fit horses and carriages of the 1600s. It’s a 900-foot-long walk, seven and a half times around the building. The Observatory at the top sits at just over 80 feet. Kids will enjoy the glass floor that looks down to the ground floor from the center of the spiral. They may be fascinated by the engineering stories of the two original “privies” or toilets. They’re not in use now thankfully. The Library privy was restored for visitors to imagine dealing with waste back before modern plumbing. 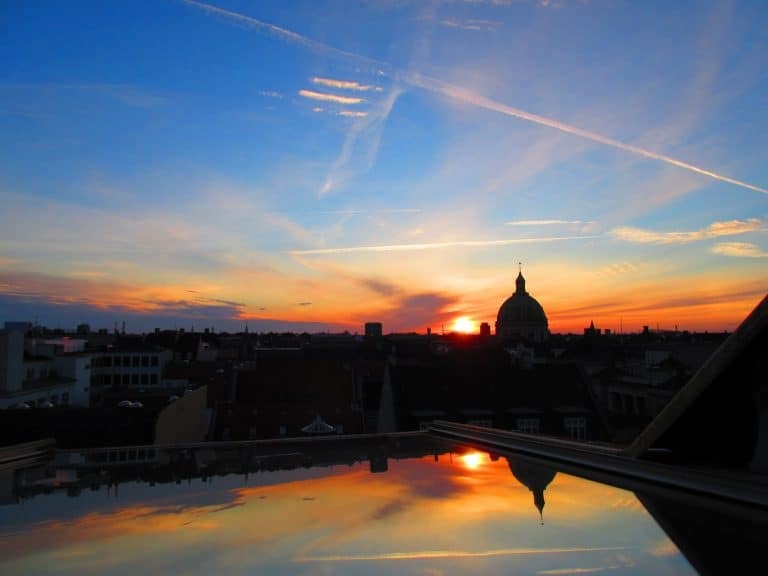 Even with all the water and harbors in this city, sunset views come from over the rooftops of the Copenhagen. This high point is a popular place to take it in and since it’s the “oldest functioning astronomy observatory” you can sometimes stay to see the stars with amateur astronomers. We have a family friend from Copenhagen and her one piece of advice was to try the open-faced sandwiches, known as Smorrebrod. 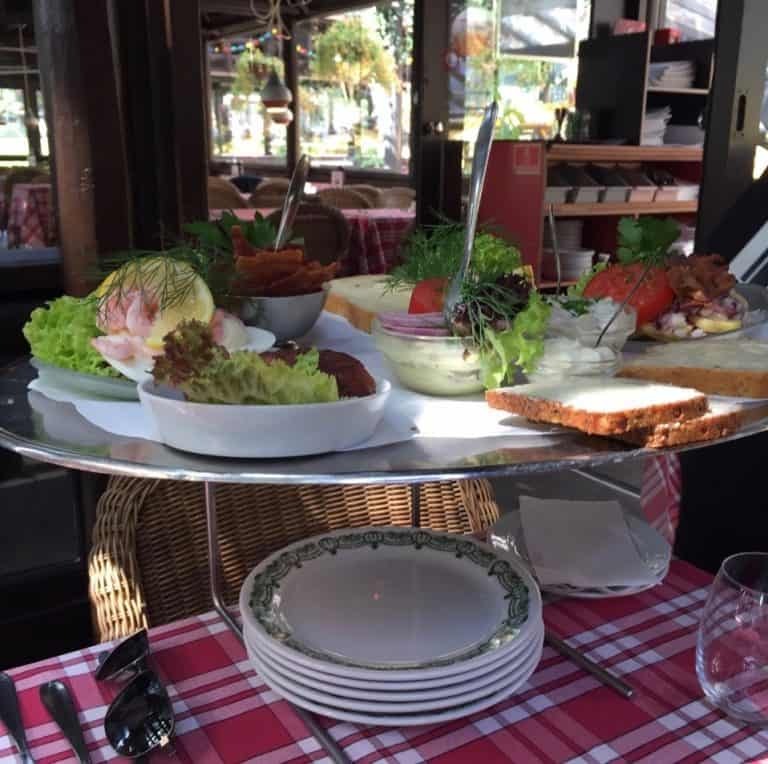 At her recommendation, we visited Restaurant Groften inside Tivoli Gardens. 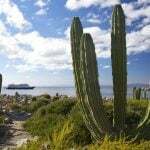 Ask your hotel concierge or host for ideas closer to where you’re staying. The experience is sort of like ordering Dim Sum. There are many options and customs associated with topping/bread pairings, order of eating – seafood or fish first and then meat. Getting the food from the plate to your mouth is best accomplished with a knife and fork. Food markets are also popular. Visit Torvahallerne, where you’ll find over 60 stands selling everything from fresh fish and meat to gourmet chocolate and exotic spices or any of the other spots locals might recommend. Northern Europe’s largest aquarium is called Den Bla Planet or the National Aquarium of Denmark. After a short train ride to Kastrup Station, it was a short walk to the aquarium along the water near the airport. En route, we noticed a permanent art installation called Blue Modified Social Benches 2015 by artist Jeppe Hein. It consisted of a series of blue benches formed in whimsical shapes that inspired conversation and play. 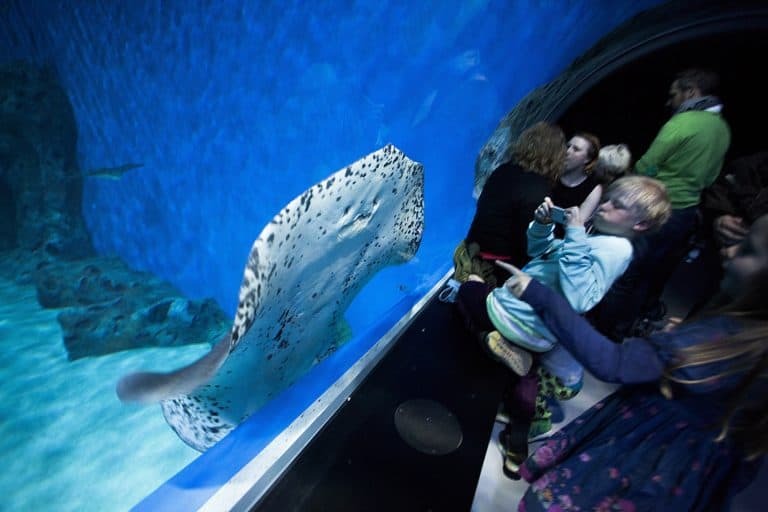 At Den Bla Planet, you’ll see sea otters, hammerhead sharks, and rays. Blue is definitely the theme and the exhibits are easy for children to access and understand. The Copenhagen Zoo’s standout exhibits include their elephant house with a bath “deep enough for the elephants to dive under so their entire bodies are covered” and the Arctic Ring with polar bears. Finally, the city is very child-friendly with a number of unique playgrounds that are worth the visit. 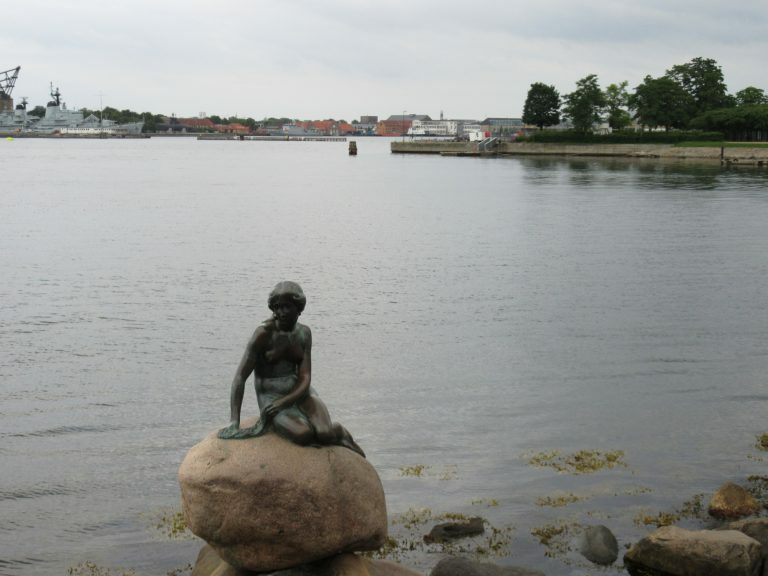 Try walking the waterfront from Nyhavn, past the Playhouse, and along the harbor past Amalienborg Palace to the Little Mermaid. There are plenty of sights to see along the way. The Little Mermaid statue will likely be overrun with tourists trying to capture their moment with this landmark. Get in line to grab your photo and then walk a few steps to wander The Citadel (Kastellet) which is a former fortress in the shape of a star. Now it’s a park area where we spotted swans swimming in the moat, along with trails crisscrossing the area with bridges and grassy areas. There’s even a windmill here. You can exit the park near the Gefion Fountain which is truly breathtaking and will conjure visions of Norse mythology featuring a mighty goddess and larger than life oxen. We didn’t invest in any of the popular harbor cruises or boat tours leaving from Nyhavn, but you’ll find this type of excursion on all the lists of things to do in Copenhagen. My editor saw the Little Mermaid statue via boat on her 6-hour flight layover and she sees it as a good option for those short on time or as an alternative to walking the waterfront for those with mobility issues. I bet Tivoli Gardens is number one on any child’s list of attractions to see while in Copenhagen. 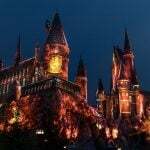 It fits the definition of an amusement park with its restaurants, entertainment, rides, and shopping. 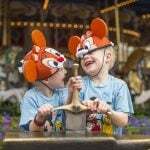 Guidebooks will tell you that Tivoli Gardens inspired Walt Disney to create Disneyland. When you walk through the gates, you will feel the similarities. 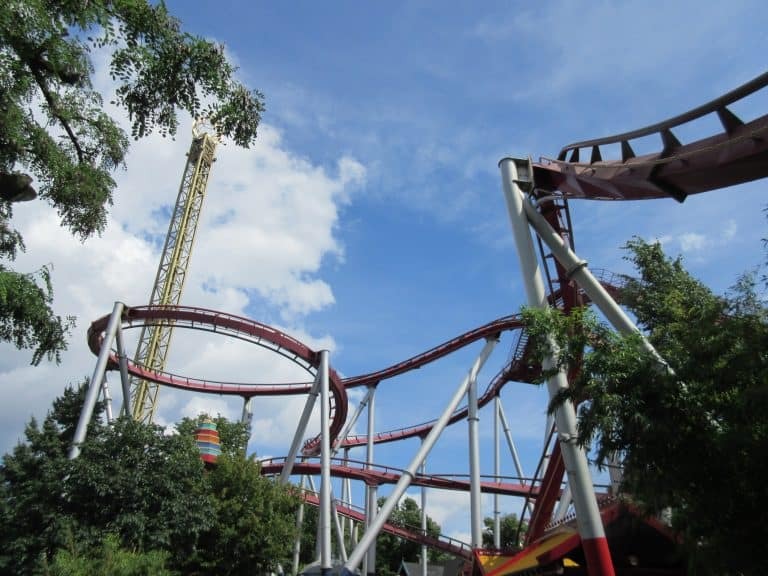 Even if you don’t like to ride on roller coasters or rides that drop, twist, spin or perform some other stomach-turning motion, you’ll enjoy watching others get their thrills. I couldn’t stop watching the hypnotic and constant revolutions of Vertigo. Don’t miss the Smorrebrod at Restaurant Groften here that I mentioned in #4. Find amazing deals on family-friendly hotels in Copenhagen. Visiting Malmo, Sweden is an easy way to squeeze two countries into your trip to Copenhagen. 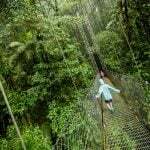 It’s only about a half hour away by car, bus or train. Remember to bring your passports. Kronborg Castle in Elsinore won its fame from Shakespeare’s Hamlet and teens might especially appreciate seeing this location in real life. 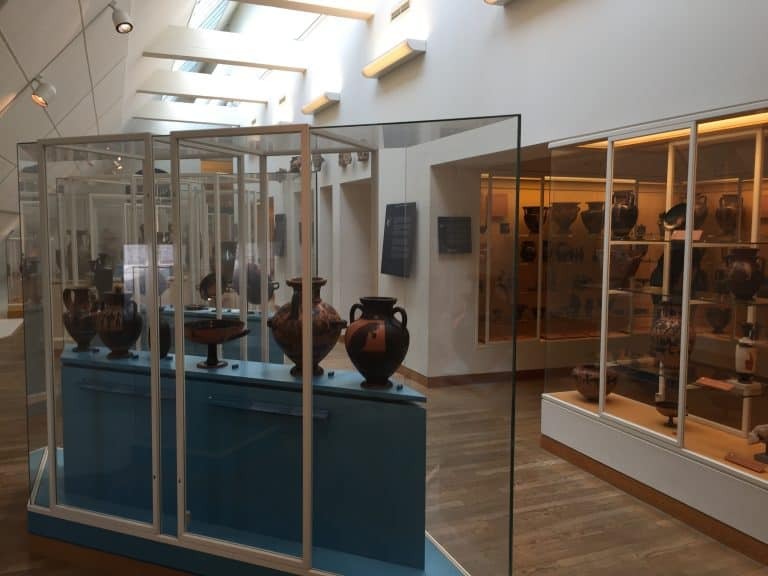 Open air museums are always a favorite with my children because they are so expansive and it’s easy to imagine living at times represented from history. The Old Denmark Open Air Museum known as Frilandsmuseet is only 30 minutes from Copenhagen. 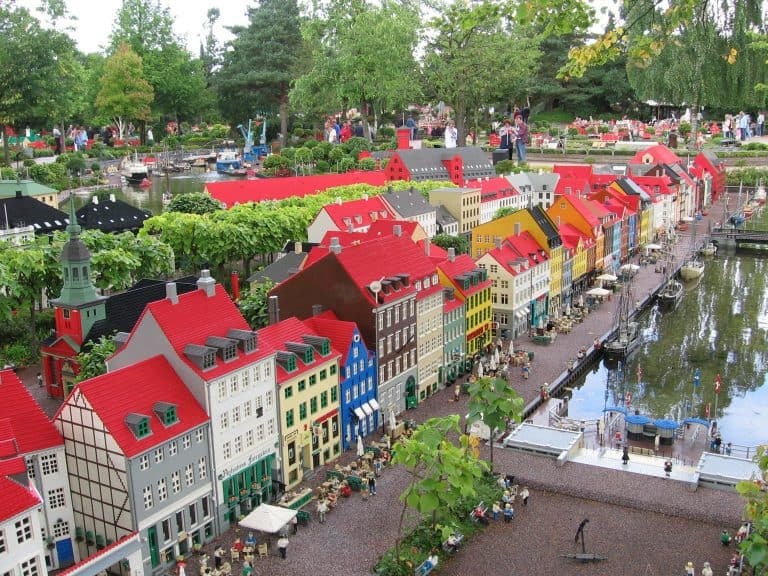 Legoland Billund Resort in Denmark, but Billund is a tad too far for a day trip (2 ½ hours by public transportation from Copenhagen). 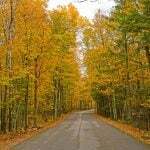 However, you can always plan ahead and make that an overnight stop on your trip. Odense, birthplace and childhood home of Hans Christian Andersen, is where you’ll find the majority of Hans Christian Andersen attractions, but again it’s a bit too far for a day trip at about 2 hours from Copenhagen. Lead image by Flickr/Jorge Franganillo. 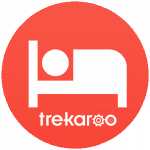 Michele Whiteaker started writing reviews and blog posts for Trekaroo back in 2011. She fulfills her travel writing passion through freelance gigs and keeps her favorite posts on her popular FunOrangeCountyParks.com blog which empowers families to explore outdoors.